I bought this myself and is in no way affiliated with any publisher. As always, my reviews are fair and un-bias. Let me start off by saying that We Were Liars was one of the best books I read last year and probably one of the best I've ever read. It took me a while to get the words of just exactly how I felt before I could contemplate understanding the book itself. Anyone who's read We Were Liars will know it's one of those rare gems that just knock you off your feet in amazement - from the plot to the characters to the gorgeous setting - it was an all around spectacular that still has me in a little daze. Candace Sinclair Eastman is the narrator of the book. Every summer, she vacations to Beechwood, a private island that her Granddad owns. Her Aunts and Cousins all stay there, the whole summer a cool breeze of friendship, fun and times without a care. Candace's family is rich to say the least, so each Aunt - daughters of Candace's Grandfather - had their own house on Beechwood. Mirren, Johnny, Gat and Candace called themselves the liars, a theme that fitted each moment I witnessed how beautifully broken their friendship truly was. Gat was the only liar not related to Candace, the nephew of her Aunt Carrie's boyfriend, which added the twisted, cracked and sweet love story that weaved it's way into the novel. It's true what everyone is saying - you'll never guess how We Were Liars will end, no matter how you pick apart the chapters. The twist is brilliant and genius, and I'm pretty sure every other want-to-be writer out there wishes they had written this - just like I wish. Even as the summers pass between the chapters, the characters still drift from exciting to suspicious to broken and subsequently the story unfolds into something bigger than ever. We Were Liars never failed to keep my attention fixed on it's wonderment and beautifully tragic ways. It's hard to say much about the novel without giving away the twists and secrets you'll so desperately want to keep to yourself and like E. Lockhart wrote in my signed copy my sister got me for Christmas (thank you, Sophie! ), please lie about this book. So I'll keep it short and sweet - mystery and alluringly fractured characters spin our simple summertime memories into something worth lying about and lying for. Five stars will never be enough. 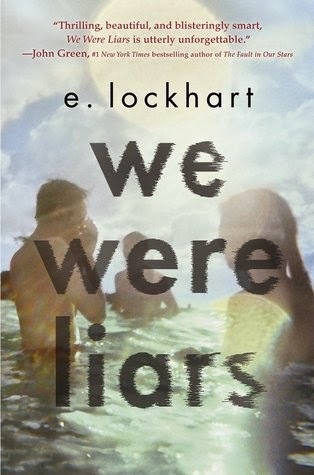 What did you think of We Were Liars? Did you think it was one of the best books of 2014?